A background of creating music for plays and films informs the feel of The Gift of Affliction, the compelling debut release from Athens, Greece-based Zinovia Arvanitidi. Loaded with crossover potential, The Gift of Affliction pulls together hints of jazz and textbook contemporary instrumental structures and anchors them with a solid glitch core to create a deeply enjoyable listening experience. Each piece here packs its own narrative/cinematic feel, bringing a story to tell or a vista to share. The central focus is Zinovia’s superb piano work; she plays with pure technique and a healthy dose of passion. The piano shines against ambient-wash backdrops and the click-and-hiss rhythms that drive each piece forward, and she shades the songs with plenty of other tones, but instrumental and thematic. Tasty melodica gives an Eastern flair to “Entangled” while a 1-2/1-2-3 bass line lays down the unwavering cadence. A great jazz feel courses through it, with Zinovia giving herself long enough–seven minutes–to stretch and play. “The Blue Shade of Dawn Covered Your Skin” glides in slowly and seductively with breathy pads, a rich low end, and more melodica. (It’s here a fair amount, and I quite like the feel it gives.) What works here is the way Zinovia gives each element a fairly simple phrase to speak, patiently layers and joins them, then drapes a gossamer symphonic-string feel over the top. “Chimera” is lounge-smooth, with strong glitch-work, gently placed wordless vocals, star-twinkle sequencing and a shift toward a rising tone in its second half that creates a genuine “ooh” moment. “Attached, Our Eyes Wide Open” closes the disc quite simply, spotlighting the piano in a perfect contemporary instrumental space, lightly accented with string sounds. I absolutely adore the very last moment here for its bare honesty, its “and we’re done” declaration. The Gift of Affliction offers a lot and delivers on it. The electronic side of it is handled nicely; the sounds take their place as backup elements to the piano and they fill out the sound without getting in the way. The piano, as noted, is crisp and affecting. 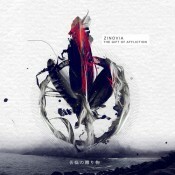 I’d love to hear a solo piano album from Zinovia. The shifting tones provide welcome diversity, yet Zinovia manages to keep things tied together thematically as the release proceeds. There’s a through-line of thought that’s well managed. This is a great end-of-day disc, one that’s laid-back but still manages to draw a lot of attention to itself. And headphone listening reaps some tasty rewards, too.